This International Signature travel trailer 23FB is the perfect unit for a smaller family or couple. 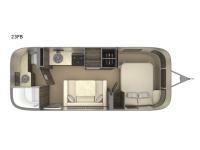 You will enjoy the rear full bath layout, and front semi-private bedroom space with a LED TV and comfortable queen bed. The 5 cu. ft. refrigerator will keep all of your perishable foods from spoiling, and you can dine comfortably seated at the U-shaped dinette or transform it into a bed at night.